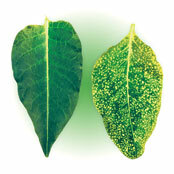 Tomato leaf on right is infected with tobacco mosaic disease. Leaf on left is healthy. Tobacco mosaic virus (TMV) is named for one of the first plants in which it was found in the 1800s. However, it can infect well over 350 different species of plants. TMV can multiply only inside a living cell, but it can survive in a dormant state in dead tissue, retaining its ability to infect growing plants for years after the infected plant part died. Most other viruses die when the plant tissue dies. The most important way that TMV can be spread from plant to plant is on workers’ hands, clothing or on tools. This is called ‘mechanical’ transmission. When plants are handled, the tiny leaf hairs and some of the outer cells inevitably are damaged slightly and leak sap onto tools, hands, and clothing. If the sap contains TMV, it can be introduced into other plants when those come in contact with this sap. Sucking insects such as aphids do not spread TMV. Chewing insects such as grasshoppers and caterpillars occasionally spread the virus but are usually not important in spread. Vegetative propagation perpetuates TMV and other virus diseases. Cuttings taken from an infected plant usually are infected even if no symptoms are immediately exhibited by the cutting. The virus particles are found in all parts of the plant except the few cells at the tips of the growing points. Infected stock plants should be discarded immediately. Tobacco products, particularly those containing air-cured tobacco, may carry TMV. Flue-cured tobacco, used in making cigarettes, is heated repeatedly during its processing, thereby inactivating most if not all TMV. When tobacco products are handled or kept in pockets, hands and clothing can become contaminated with TMV and be a source of virus. TMV is NOT spread in the smoke of burning tobacco. Some of the above symptoms can also be caused by high temperature, insect feeding, growth regulators, herbicides, mineral deficiencies, and mineral excesses. TMV diseases cannot be diagnosed on the basis of symptoms alone. Bring a sample of the infected plant to your nearest Extension office for diagnosis. No chemicals cure a virus-infected plant. Remove all weeds since these may harbor TMV. Remove all crop debris from benches and the greenhouse structure. Set aside plants with the above symptoms and obtain a diagnosis. Disinfest tools by placing them in disinfectant for at least 10 min. Rinse thoroughly with tap water. Disinfest door handles and other greenhouse structures that may have become contaminated by wiping thoroughly with one of these materials. Propagate plants via seed rather than vegetatively. Thoroughly wash hands after handling tobacco products or TMV-infected plants. Do not keep tobacco products in the pockets of clothing worn into the greenhouse. Launder greenhouse work clothes regularly.